Jason at RPC Electronics sent me a prototype of the new RTrak-HAB tracker that he's designing for high altitude balloon use to test and use for Le Grand Saut, SABLE-4 and other flights this summer. It's based on Scott's Open Tracker OT1, a Trimble Copernicus GPS and SRB MX146-LV transmitter and by far the best tracker I've used. It has telemetry capability, the Copernicus GPS has been immune to RFI from digital cameras it's been used with in close proximity, the MX146-LV transmitter doesn't drift off frequency with temperature changes like others I've been using and only a battery and a GPS & VHF antenna had to be added for a complete, light weight, working tracker. Following is what I've found and done so far with the prototype, but keep in mind that this is a prototype and some things will be a bit different and even better on the final version. Left - The main board with the OT1+, Copernicus GPS receiver, 5V & 3.3V regulators and a second image with the MX146-LV transmitter that plugs into 2 headers on the board. Board Size is 2.08" x 2.75" and tracker thickness with transmitter is .67". Weight is 30.7 grams and less then 50g with a typical ceramic GPS antenna. 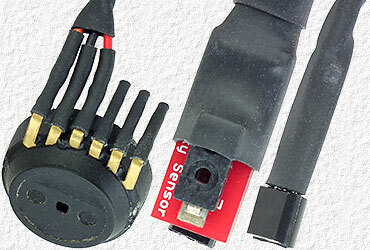 In addition to GPS data the tracker also provides 7 channels of analog and 8-bits of digital data. 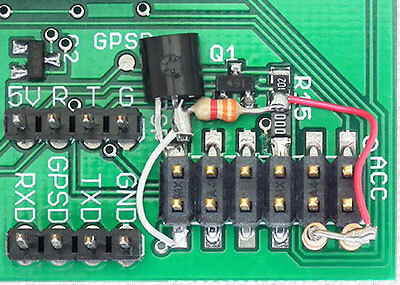 The APRS telemetry frame provides 5 analog channels and the temperature and battery voltage is reported in the comment field. Connections to the analog inputs, 1 wire interface and several other signals is by a 12 pin accessory header. 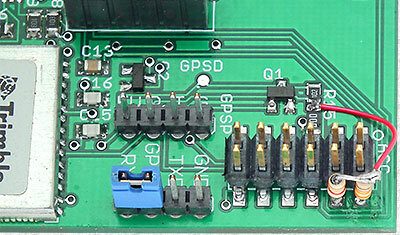 There are unused pins on the OT chip which could also be used for whatever with some extra programming. I already have several things in mind and have suggested to use slightly larger solder pads for these pins in the final version to make it easier to connect to them or to possibly even lay out the board to allow a FET switch to be added on each pin for controlling other things based on GPS and/or telemetry data, much like what's available now for the profile switch. The SRB MX146-LV transmitter is temperature stable, frequency agile and only 6.2g. Output power is spec'd as 350mW minimum and this one's ≈400 mW (closest I can measure with what I have available). It's the best little transmitter I've found for balloon use, but unfortunately not currently being manufactured and unknown when more will be available so hard to know when the RTrak-HAB may actually become available. Input voltage (red & black wires) is via 2 pads & reverse voltage protection diode D1, but in this photo the diode has been replaced with a 0 ohm resistor to eliminate its .67V drop. The 2 resistors next to the 0 ohm resistor & smaller red wire are a voltage divider & wiring that had to be added to report the battery voltage and that were forgotten on this prototype unit. Input voltage can be as high as 18V or as low as 6.9V with diode D1, or 6.15V without the diode, before the 5V regulator is unable to maintain regulation. Idle current is ≈ 90 ma. and 325 ma. when transmitting. A wire from 5V and 2 resistors were added on 2 of the analog inputs for LM335 temperature sensors. Again, this is a prototype and pads for SMT resistors on each input will be provided on the next version for sensors that require a current source. The 12-pin connector made connecting several sensors fast and easy. Until more SRB MX146-LV transmitters and next version of the RTrak-HAB become available it makes little sense to go into much more detail or say more then it's nice to see that a great little light weight ready to use tracker will soon be available. Meanwhile, I will be trying more things with the prototype and adding to this report as I do. July 8 & 15th - 2 more successful flights (BEAR-7 & BEAR-8) were made with the tracker with 2 cameras aboard and simply using a rubber duck antenna. We were a bit concerned on BEAR-7 with all the tin foil space suits in the payload right next to the antenna, but the MX146-LV transmitter & antenna appeared to work as well as on the following flight with no tin foil. A LM335 temperature sensor has now been added on the board and to the input reporting the temperature in Celsius in the comment field to save having to connect the other temperature sensors and converting their telemetry voltage values to °C while further testing and playing with the tracker. patch antennas we've been using. This antenna also only requires 3.4 ma. possibly affecting it in any way. will be posted when this has been done. 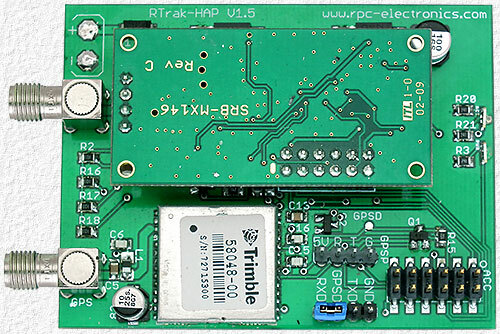 Update, Nov 2010 - As mentioned before, V1.5 of the RTrak-HAB seen above is a prototype, but I have just finished reviewing the revised schematic and board layout of the next version that will become available to purchase once more MX146 transmitters become available which appears will be soon. I'll show and comment on the new version as soon as one is available, but for now here's a few things to look forward to. On the prototype I removed the reverse voltage protection diode to save it's .67V drop and had also planned to replace the 5V regulator with a KF50BDT, as I did on the Micro-Trak 300, to further reduce the required operating voltage and allow using just 4, rather then 5, AA cells, but the 2 regulators have different pin outs so this wasn't possible, but none of this will be required on the new version as it will have a KF50BDT regulator and no diode. 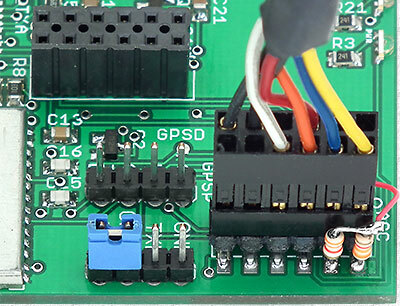 The resistors required to report the battery voltage have been added of course as well as an on board temperature sensor and resistors for remote temperature and similar sensors. The ACC connector has also been expanded and will include 4 programmable outputs for controlling whatever. One output will supply 5V when activated and as soon as one of the new boards is received I'll show how to use it to have multiple CHDK cameras simultaneously take a set of images on each transmission. This will allow making panoramic images from each set of images and having the tracker control cameras will save countless time later trying to figure out exactly when, to know where and at what altitude, each set of images was taken. The other 3 outputs will be a FET switch to ground which I'll also show how to use for several things I have in mind once the required software is available. Update, Dec 24, 2010 - It's been a long wait, but the date for more MX146 transmitters, and therefore RTrak-HABs, appears to be close. Update, Jan 21, 2011 - Everyone likely already knows MX146 transmitters are once again available and a RTrak-HAB V1.9 is on it's way for evaluation. 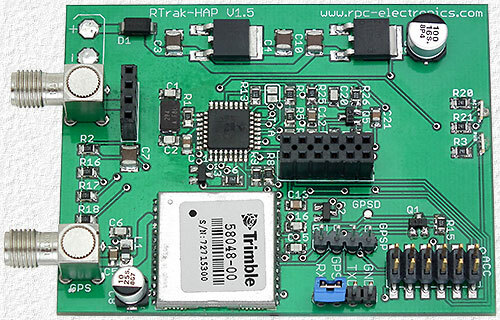 When received, likely next week, photos and a description of the changes and new features will be posted and then everyone will be able to order and get their own RTrak-HAB from Jason at RPC Electronics. In the mean time there's some photo's and information on Jason's RTrak-HAB Page of the final version. 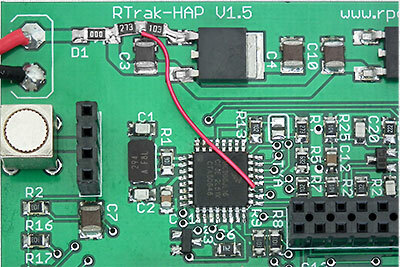 Update, Jan 28, 2010 - The RTrak-HAB V1.9 tracker I was waiting for has arrived.